Ancient Stones - Borders - 038 Standing Stone, Chatto Craig, Hownam. 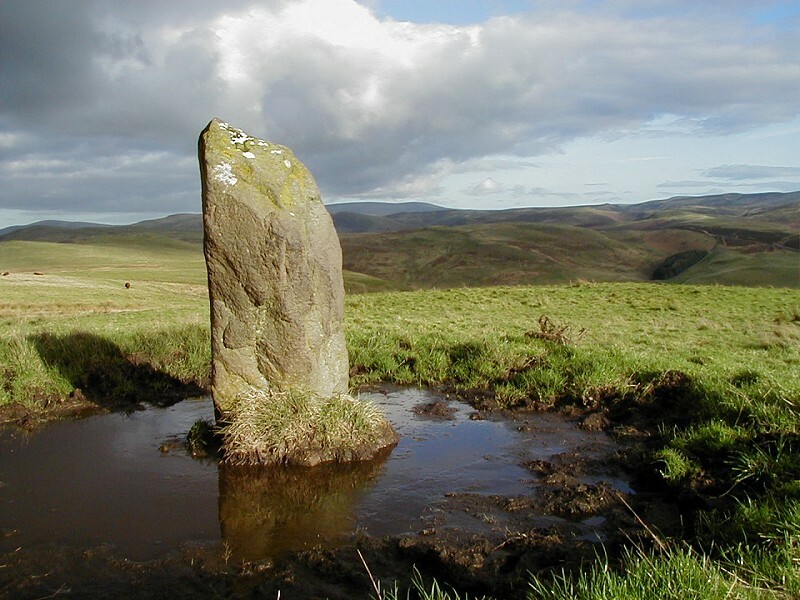 This solitary standing stone is located just over 0.5km west of Dere Street, opposite Trestle Cairn and visible from the Roman road, stands to 1.50m high and has a girth of 2.15m at base. The stone stands on the crest of a slight rise and has it's major axis aligned north - south. The muddy pool that usually surrounds the stone during the winter months probably results from cattle using the stone as a rubbing post. The setting offers outstanding views of the Cheviots to the south. To the west of the stone, on the summit of the ridge, can be seen a weathered stone protruding from the turf, measuring 0.60 x 0.40m. This may be the remains of a further standing stone. Some surface disturbance can be seen on the ground to the NNW. This site is best reached by following Dere Street, the Roman Road. Take the minor road running south from Hownam then head right for Oxnam. Dere Street is crossed at Pennymuir Forest, at the junction leading to Towford Outdoor Centre. On foot or by mountain bike, follow Dere Street north until Trestle Cairn is reached. The standing stone can be seen to the east along the fence line. Note that parts of the route are very wet and boggy and sturdy footwear is recommended. One splendid standing stone and only a few metres away the stump of a possible companion stone, certainly gets the imagination going. What was the purpose of these stones? What rituals took place here? Perhaps, one day when time travel becomes common place will we be able to share the secrets that the stones withhold. This is also one of the sites that has much more to offer than just a solitary standing stone. At first glance you only see the stone but a possible second stone offers a tantalising glimpse of what might have been. With a little thought, does the inky-deep pool become something other than the results of the fall of countless cloven hooves? The Trestle Cairn can be seen to the west, what is the connection? At the next stone you visit, take off your modern and scientific hat and let your imagination run free. Look for what might have been, or what could be still. Look for the secrets that the stone has been waiting to tell.